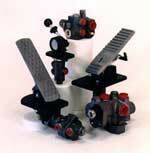 Hydraulic Brake Valves are designed for use with vehicles that are equipped with other hydraulic power devices. This design feature eliminates the need for a separate power brake unit or separate hydraulic fluid system. The open center valves can be used in open center hydraulic circuits without requiring additional components. Modulating valves can be used in open center circuits when accompanied by a charge valve, or in a properly sized closed center hydraulic circuit. When replacing your spark plugs, lubricate the threads with Never-Seize or a similar lubricant to make the plugs easier to remove the next time you want to change them.